There is an extensive process in place in order for a food product to receive the USDA Organic Seal, and this is an example of effective quality management methods in practice. 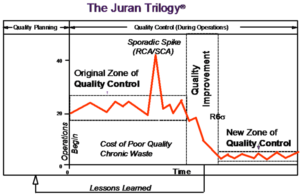 One way to understand the organic producer certification process is to compare it to the Juran Trilogy®. The USDA organic regulations were developed by the National Organic Program (NOP) and describe organic products as those that have been produced using “cultural, biological, and mechanical practices that support the cycling of on-farm resources, promote ecological balance, and conserve biodiversity in accordance with the USDA organic regulations.” Organic foods may not be treated with synthetic fertilizers, antibiotics, synthetic medicine, or hormones, and cannot be genetically engineered.1 Before attempting to become certified, producers must carefully consider how they are going to run their organization. This process is where Quality Planning, the first stage in the Juran Trilogy, occurs. The producer must define who their customers are and the requirements for their products, and start to figure out how to implement those requirements into their processes. In order to become a certified organic product, the producer must follow organic practices for three years, and then to maintain certification they must pass yearly inspections from a certified inspection agency. The yearly inspections represent the Quality Control stage of the Trilogy. There are standards set by the inspection agencies which must be met in order to maintain the status of an organic producer. In this stage, it is critical to ensure that the organization responds to the feedback received from the certifying bodies, which may include notification of violations. Quality Improvement, the last phase in the Trilogy, requires the identification of projects for process improvement. If a producer is found to violate one of the organic procedure regulations, they will be fined and forced to make the necessary corrections. Organizations can also make improvements before they are detected as issues. If a process is found to be wasteful or inefficient, the root causes should be investigated and then remedied. In the Trilogy, the journey towards quality leadership is not over until the trilogy of process is completely integrated within the organization. So whether your organization is at the beginning of its quality journey or has only partially integrated the Juran Trilogy® of quality processes, learn about the importance of how these three processes work together so that the benefits of quality leadership can be realized.